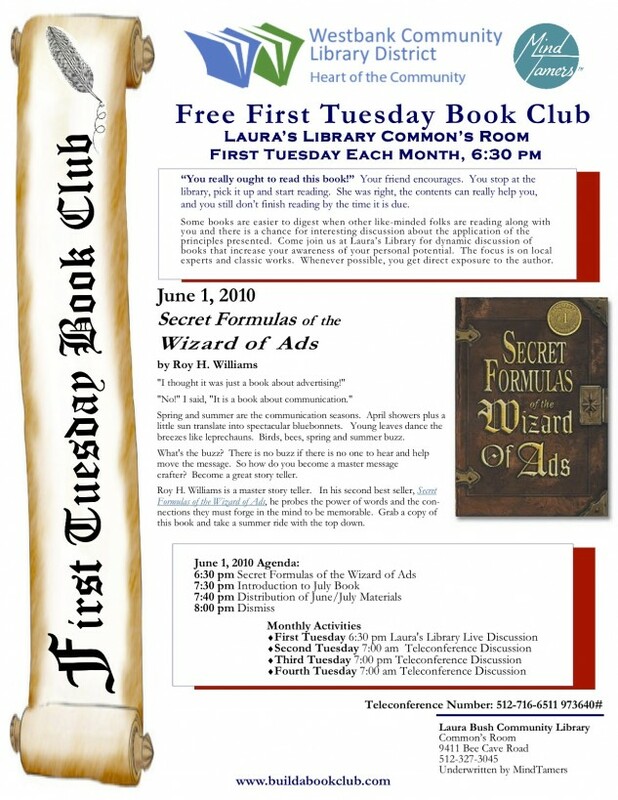 June 1, 2010 First Tuesday Book Club Secret Formulas of the Wizard of Ads | WHAT’S UP WITH THAT GREAT BOOK YOU NEVER FINISH READING? I am interested in joining the First Tuesday Book Club at Laura’s Library. What book should I read for the July meeting? I missed the June meeting. The book we are currently reading is Ruby And the Stargazers: A Fireside, Texas Novel by Marci Henna. This is a work of fiction based in a fictional town in Texas. For a nice Father’s Day contrast, consider reading Reel Livin’ by Warren McClenagan from up around Amarillo. His are true stories and it is just great to compare the two books. Our next live meeting in August 17, 2010 at 6:30 PM at Laura’s Library to discuss and practice the skills for Parent Effectiveness Training. It’s mind boggling how many videos and news come out on a weekly basis.